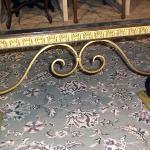 This is a beautiful example of a bygone era and quality of workmanship. Would look great in any decor! WAS $475.00 . . . Solid Oak, smaller size, golden oak color, rectangular top. WAS $190.00 . . . Solid Birds Eye Maple Cribbage or possibly lamp/side table. Shelf under, nicely turned legs, golden coloe with good graining visible. 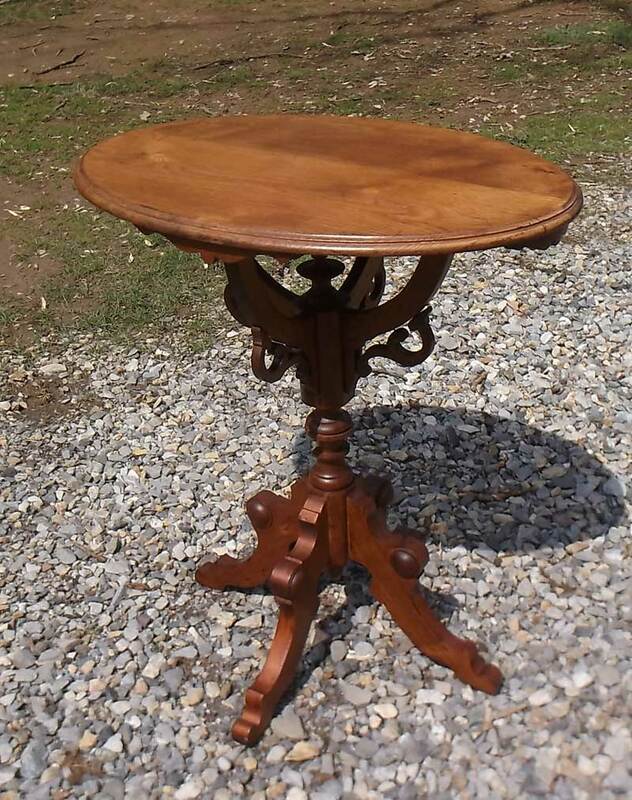 Nice early mahogany candlestand, 8 sided banded edge, spider legs. 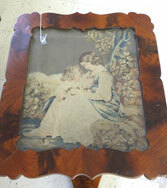 Most likely early 1800’s vibntage. Lovely oval cherrywood side table with satinwood and mother of pearl inlay, lower shelf, and gracefully curved legs. 33 ½”L x 23 ½”W x 29 ½” H 21"
WAS $175.00 . 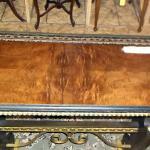 . .
Lovely and formal mahogany coffee table, with banded inlaid top, sliding extension sides, tapered, banded legs. 1 drawer each, turned legs. WAS $275.00 Pair. . .
Bowed front, line inlaid drawer fronts with ring pulls, tapered Hepplewhite style legs, Shown as found, will be cleaned, and restored prior to delivery. Walnut tuckaway table with long drop sides, swing out gate legs. Shown as found, will be cleaned, and restored prior to delivery. Smaller, night table sized 3 drawer stand, raised panel drawer fronts, slight bow front. Shown as found, will be cleaned, and restored prior to delivery. Solid steel with plastic privacy screen, folding side shelf, hooded legs with casters. Good original paint, circa 1950. Mid century, John Widdecomb bedstands, gracefully curved legs, scalloped tops and drawer fronts, with open compartment above. WAS $295.00 pair . . . 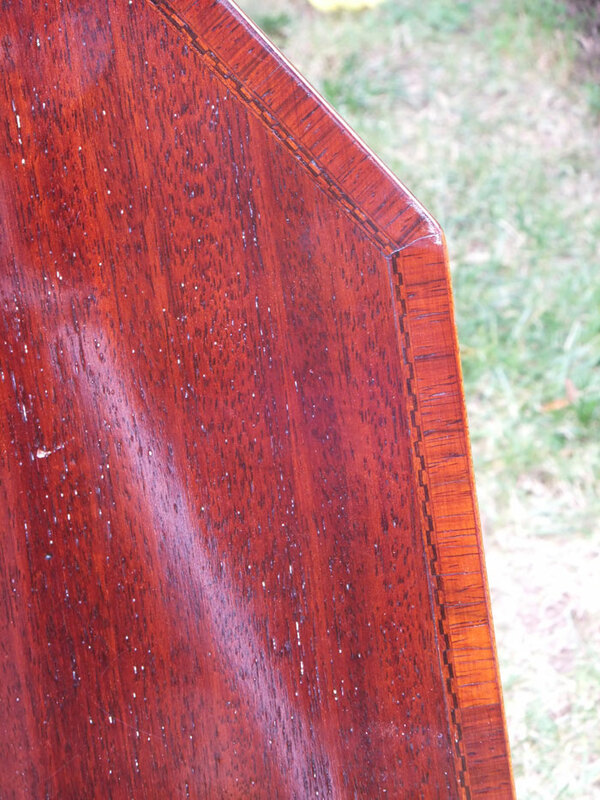 Solid Cherry body, 1 board top, solid Tiger Drawer front, turned legs. Great age and patina! WAS $275.00 . . .
WAS $345.00 . . .
Lovely small Duncan Phyff styled mahogany coffee table with lift off glass butler’s tray. 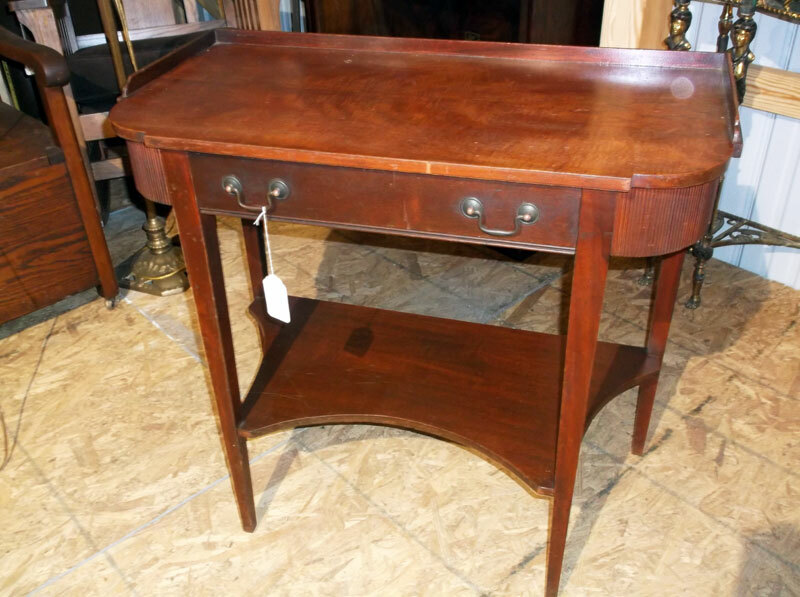 Solid cherry, narrow size with drop sides, tapered legs, single drawer with batwing pulls. WAS $325.00/Pair . . . Graceful curved legs with cloven hoof feet, long and narrow. 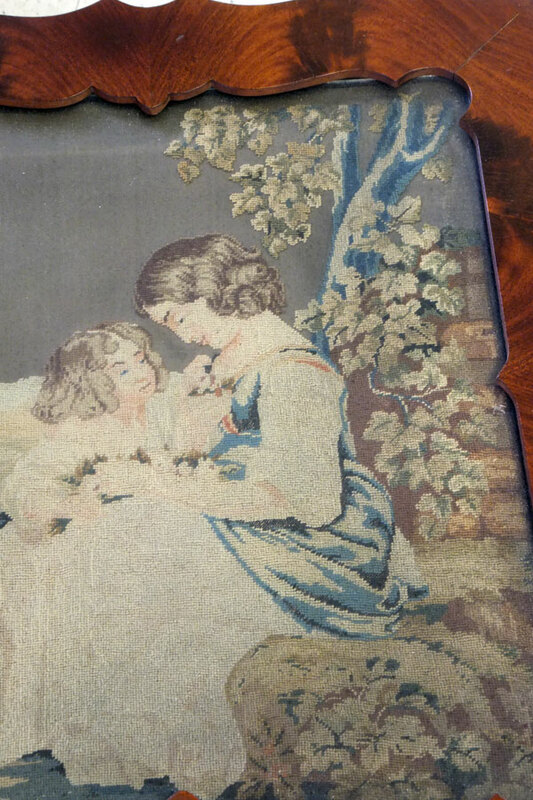 Great for behind sofa, under windows, hallway, wherever! WAS $195.00 PAIR . . . Note the intricately carved sides on these tables!! Carved flowers and DEEP diamond pattern, embossed legs on all outward sides, 4 sided high galleried sides to contain things. Great color and finish. EXTRA LARGE SIZE! WAS $185.00 as shown . . . 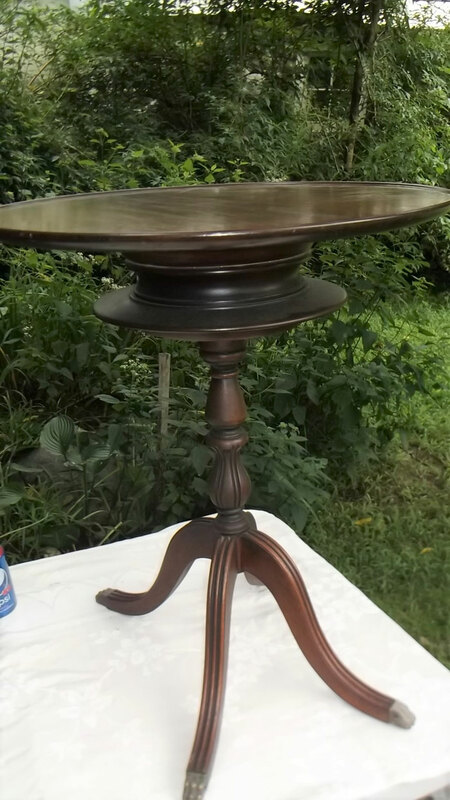 Very sweet tilt top pie crust table, solid mahogany, top is laid out with four pie shaped slices and carved pie crust edge detail. Table top can sit flat, or fold vertically. Tot rotates to sit 1 foot in corner, or 2 feet against the wall. Legs and feet below also feature heavy carving, pierced centers. Column is fluted with an upturned shell below. Don’t miss this one! Adorable little stand perfect alongside an easy chair to hold a drink, etc. Scalloped top with edge, three legged base, very cute! 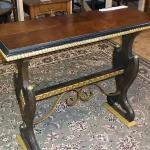 Black Marble top, turned legs, solid walnut frame with Iron stretcher under. 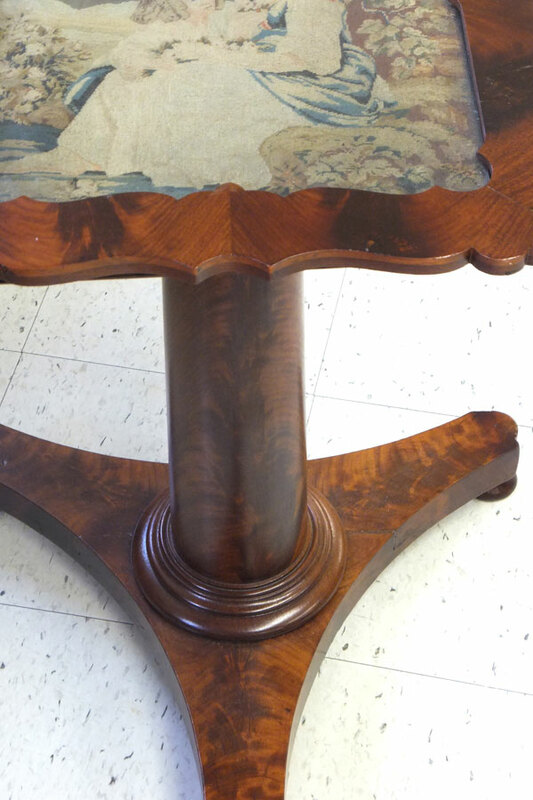 Octagonal top, nicely carved details in legs and side skirts, turned legs with lower shelf, completely refinished with golden oak color. Not the usual game table that you see everywhere else! 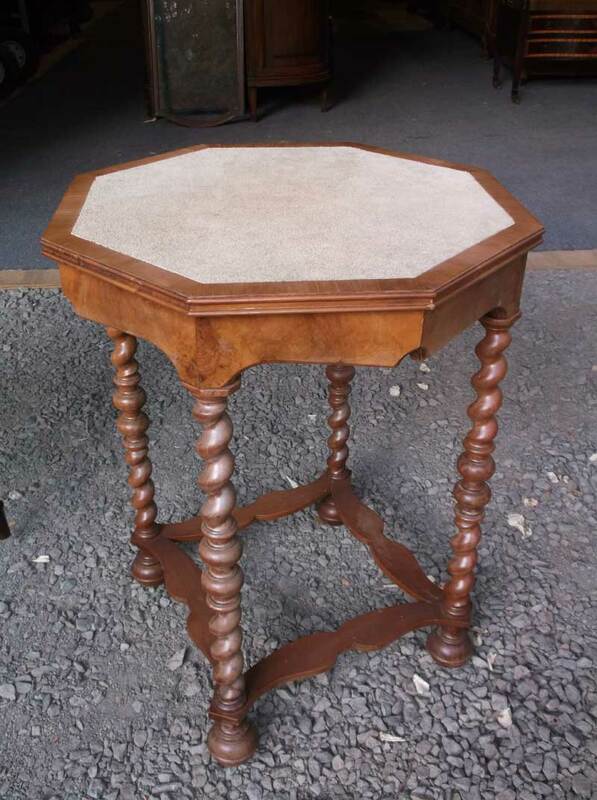 This oversized table dates back to early 19th century, with well detailed paw feet, and solid mahogany top. 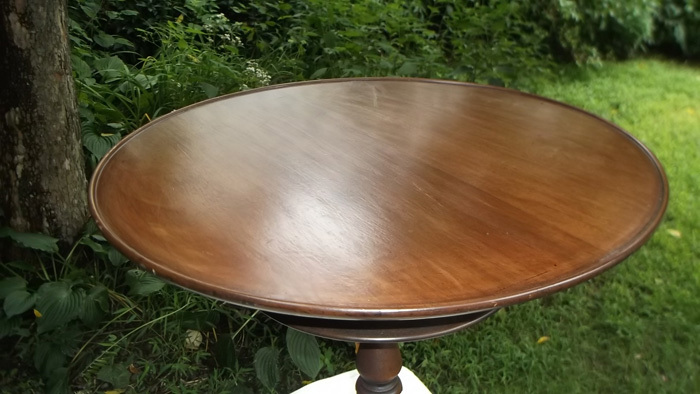 Beautiful flamed mahogany skirt, column and base, a true head turner! High quality, early 20th century free standing console table with burled drawer, heavily carved columns, feet, edge details and applied carvings. Very striking and solid! Solid Oak, lower shelf, single drawer with bakelite pulls, fluted legs and applied carvings on feet. Same era as Eastlake, but higher quality furniture. 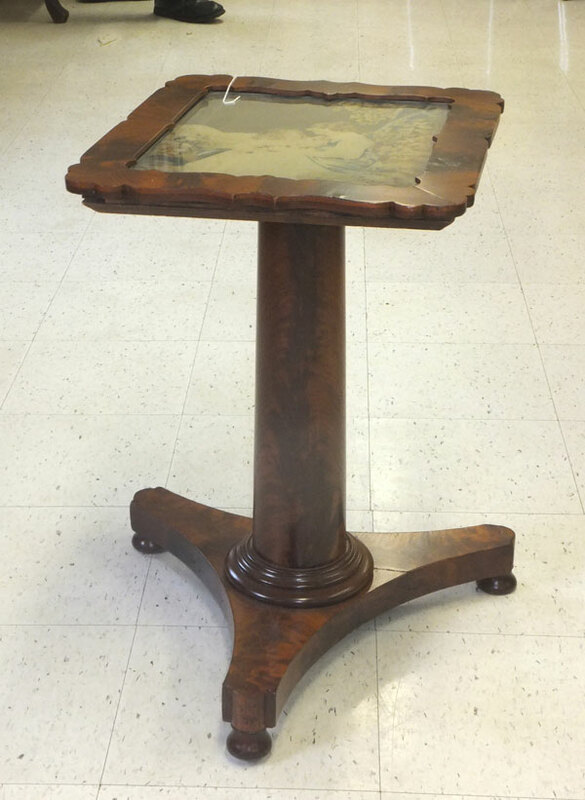 Framed table top captures marble, twisted column and nicely carved 4 lagged base. Pretty pink, white and brown marble, not cracked or broken. 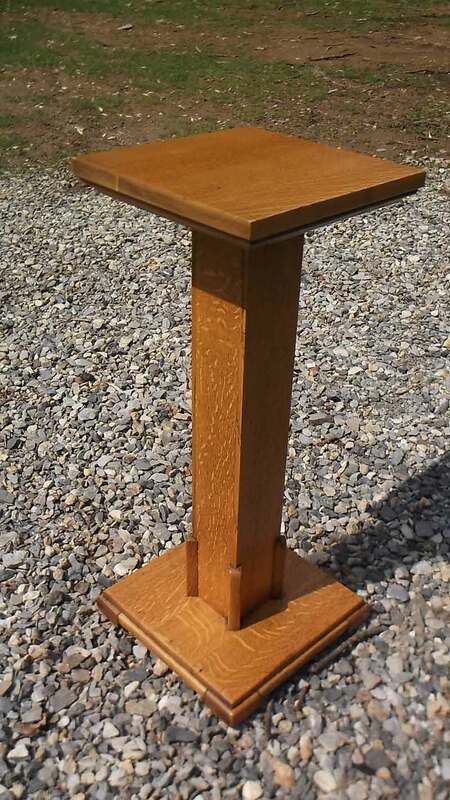 Solid Oak pedestal with a mission feel, golden oak color, perfect for a flowing plant or jardiniere. Circa 1930 Mahogany stand with Lazy Susan 360 degree rotating top. Pie crust dish top, Duncan Phyff styled legs, brass capped paw feet. Good color and finish. Solid rock maple stand, spider legs, good color and finish. Very sweet little stands. 3 Drawers each, faux painted tops, gold highlights, carved knees and skirt. Wear commensurate with age, but still very nice!